Pass this model motion, from Trinity Saint Davids Student Union, in your SU! On the 70th Anniversary of the Declaration of Human Rights, we saw the conviction of 15 Human Rights Defenders in the UK. The ‘Stansted 15’ took courageous action in preventing the takeoff of a chartered detention flight in the UK leading to eleven people – including victims of trafficking recognised under the Modern Slavery Act – being able to remain in the UK with their loved ones. 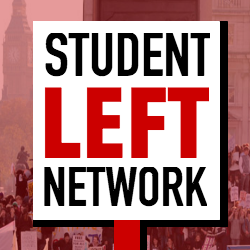 In Britain there has always been a great tradition of solidarity, and indeed this has existed in the student movement too. The ‘Stansted 15’ have been convicted of ‘endangering an aerodrome’ under the Aviation and Maritime Security Act 1990 – a terrorism related law, created in the wake of the Lockerbie Bombing. The misuse of this legislation is grossly disproportionate and a clear abuse of power. It seems evident the government and prosecutors wish to stop actions of solidarity, peaceful protest and civil disobedience all of which are legitimate and indeed critical aspects of a functioning democracy. The Home Office has behaved disgracefully with many aspects of their despotic behaviour coming to light in recent months and years through the stories of the ‘Windrush Generation’, the harrowing tales of asylum seekers in detention centres where evidence of physical, mental and sexual violence has been brought to light and the fact the UK deports people before their cases and appeals are heard. We are calling for the end of the hostile environment, the immediate closure of detention centres and the ending of the shameful practice of deportation flights. We call on the government to quash the convictions of the Stansted 15 and ensure they do not spend a day in prison. The UK Government’s hostile environment should have been on trial, not the Stansted 15.